Are you interested in radio communications? Are you a Shortwave Listener (SWL)? Were you a CB'er back in the day? Would you like to get your Amateur Radio Licence? 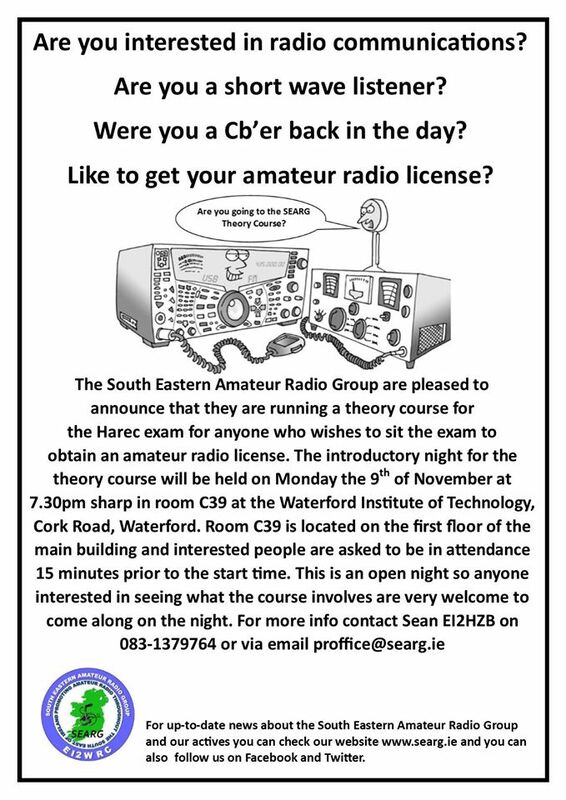 We (South Eastern Amateur Radio Group) are pleased to announce that we are running a theory course for the HAREC syllabus for anyone who wishes to sit the exam to obtain an amateur radio licence. The introductory night for the theory course will be held on Monday 9th of November at 7:30 p.m. sharp in Room C39 at the Waterford Institute of Technology, Cork Road, Waterford. Room C39 is located on teh first floor of the main building and interested people are asked to be in attendance 15 minutes prior to the start time. This is an open night, so anyone interested in seeing what the course involves are very welcome to come along on the night. Theory Class Information Evening a Great Success!